Official Product of Ultimate Arms Gear, Brand New. Set of 2 Steel Swivels 1" Wide + Wood Screw Studs 1/2-Inch and 3/4-Inch Screws. Designed for Shoulder Harnesss or Claws 1" Wide or Less. All Steel Construction, Black Finish. Super Heavy-Duty Swivels, Will Hold Up To Years Of Heavy Outdoor Use. Quick and Easy Installation. Fits Wood and Most Synthetic Stocks & Forends. 2 White Spacers Included to Insure a Secure Tight Fit and Not Scratch The Rifle / Shotgun. 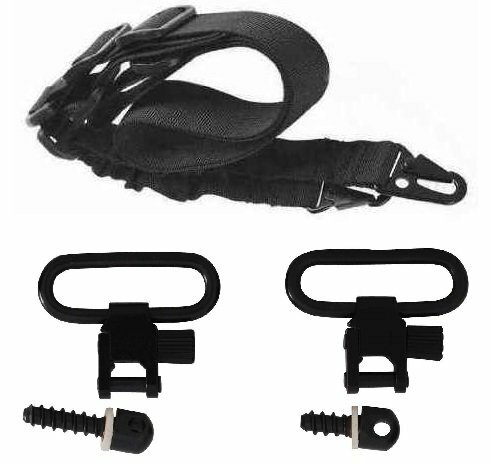 Package Includes: Set of 2 Steel Swivels + Wood Screw Studs 0.5" & 0.75" + Two-Point Sling. All Steel Construction, Black Finish. Super Heavy-Duty Swivels, Will Hold Up To Years Of Heavy Outdoor Use. Fits Wood and Most Synthetic Parts. 2 White Spacers Included to Insure a Secure Tight Fit and Not Scratch. Black - Premium Wide Weatherprooof. Superior Quality Metal Hooks For Operation. High Strength - Fully Adjustable To Provide Different Lengths For Various Shooting Positions Great For Close Encounter And Battlefield Operation.